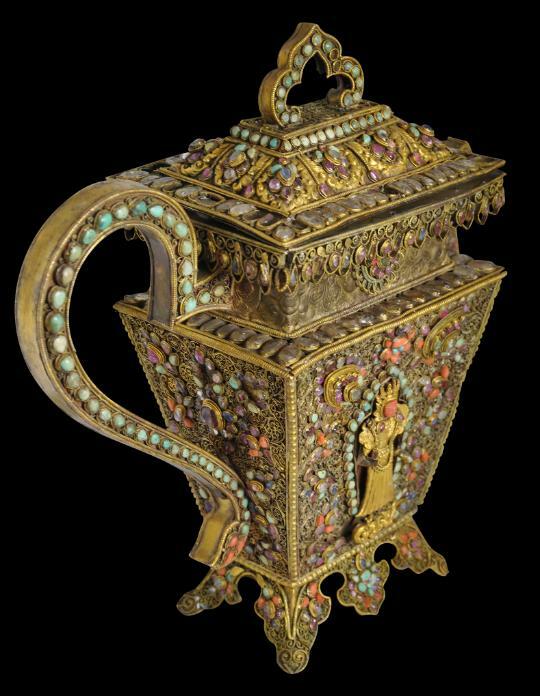 This magnificent gilded (gold-plated) ewer of beaten copper sheets, chased, engraved and overlaid with filigree applique and inset with precious and semi-precious stones is very much in the style of the Newar people of the Kathmandu Valley. 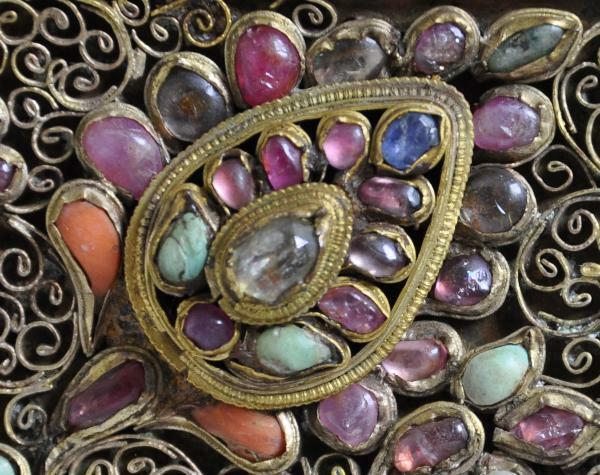 The wear, loss to the gilding, lack of faceting of the stones, relatively simple box settings for the stones, and the relatively wide spacing of the applied filigree suggest an earlier rather than a late dating for this piece. 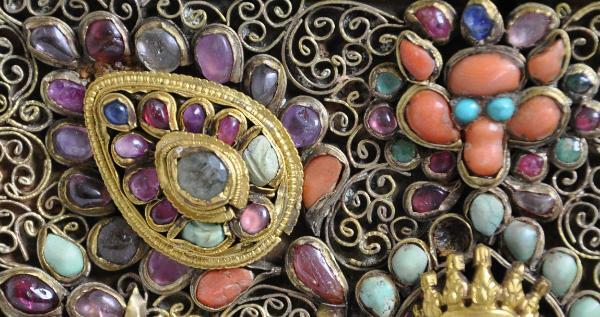 Similar items in the Jacques Marchais Museum of Tibetan Art are given a 17th-18th century dating and the Metropolitan Museum of Art uses a dating of 17th-19th dating for related items. So a dating of 18th century and possibly even 17th century for this piece seems feasible, particularly given the more sophisticated stones and settings used in some of the Metropolitan Museum of Art’s pieces. The ewer is ornate and complex. 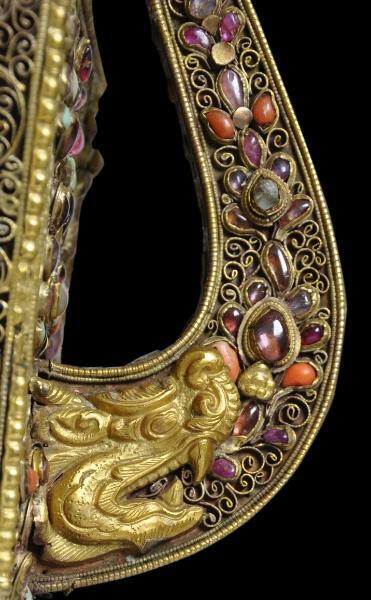 Importantly, the stones on the ewer are not foil-backed glass but a mixture of sapphires, rubies, spinels, coral, turquoise and rock crystal. 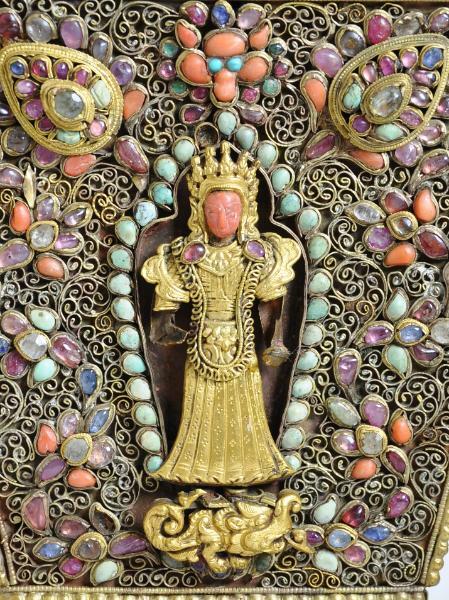 Both sides of the ewer are decorated with central standing figures – possibly Prajnaparamita and Saraswati. One has a face of carved turquoise, the other a face of carved coral. Both have long, pleated costumes heavily coated in gold. Protective kirtimukha faces are marked out in coral and other stones. 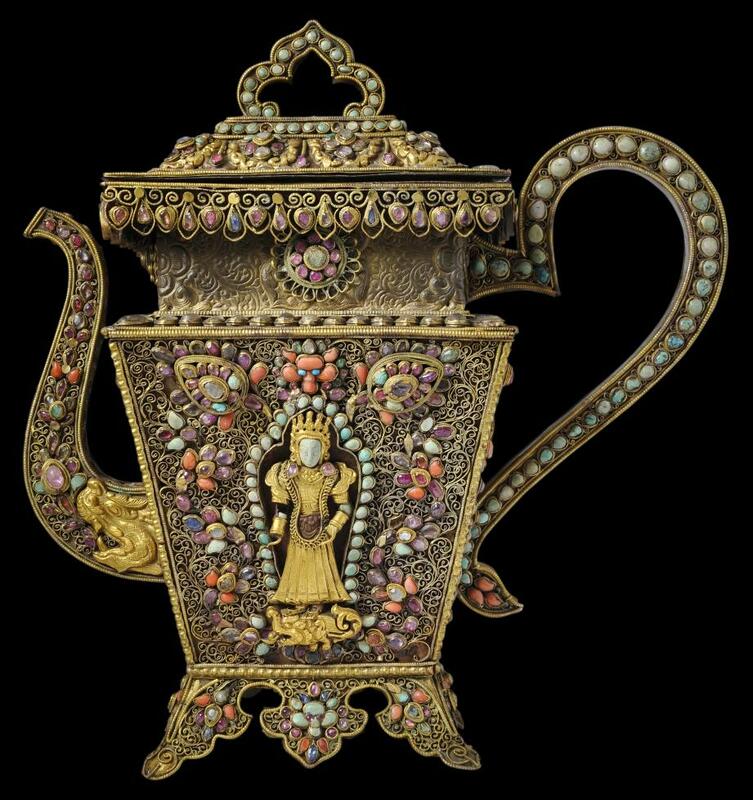 There are makaras, in thickly gilded copper, including prominent examples on either side of the base of the spout. The foot comprises an open-work, scalloped apron that is decorated in the same style as appears all over the body of the ewer. 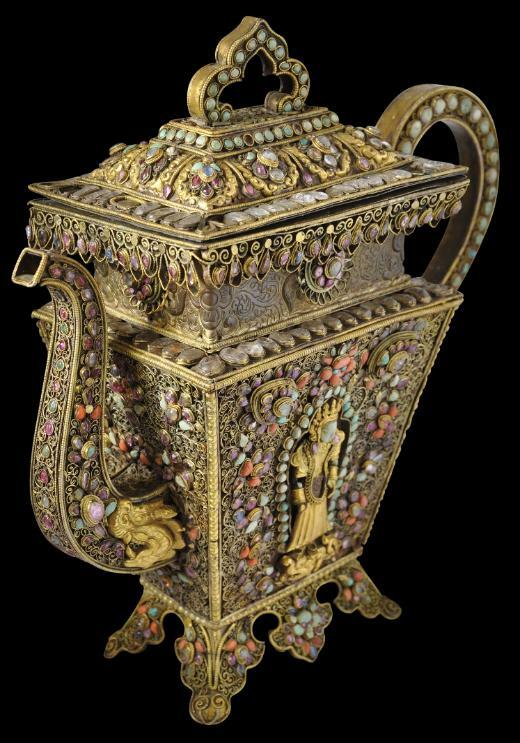 The spout is set with precious stones all the way up. The prominent ‘S’-shaped handle is set with turquoise and coral cabochons. The rectangular, domed lid lifts off completely. 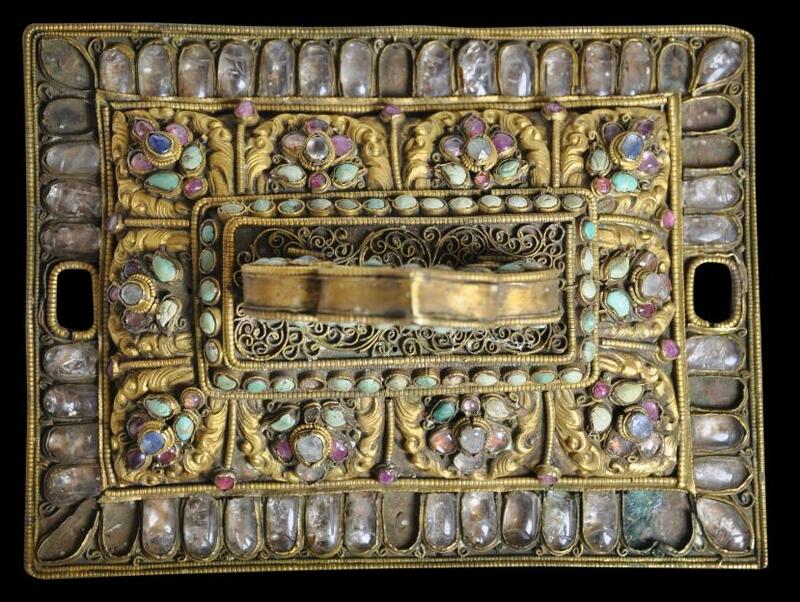 It has a border of large rock crystal slices all the way around emulating a lotus petal border. 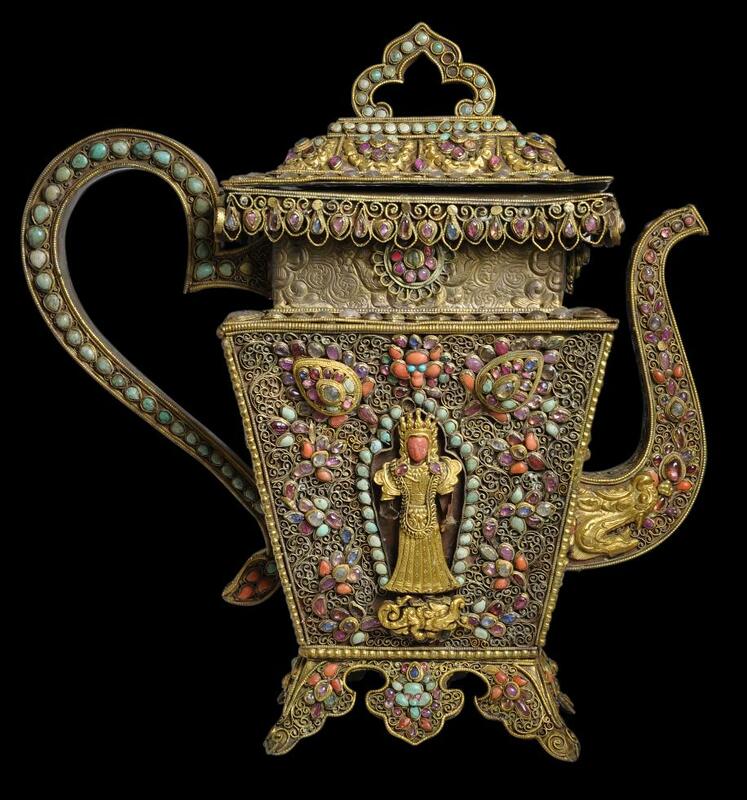 It is possible that such a ewer was intended to use in the making of offerings to Bhairava, the angry manifestation of Shiva. In Nepal, the god tended to be placated with offerings of alcoholic beverages. to see a related but possibly later offering dish in the Metropolitan Museum of Art. The ewer is in fine condition for its age. There are some weaknesses to the joins but these appear to be stable. The lid no longer is completely flat. The stones have been applied with what is likely a plant or animal base resin which has now dried and contracted. Some stones have been lost as a consequence. Some small sections of applied metalwork have also been lost. But overall, the stones and the decoration largely are intact. Overall, this is a large, sculptural and unusual item. 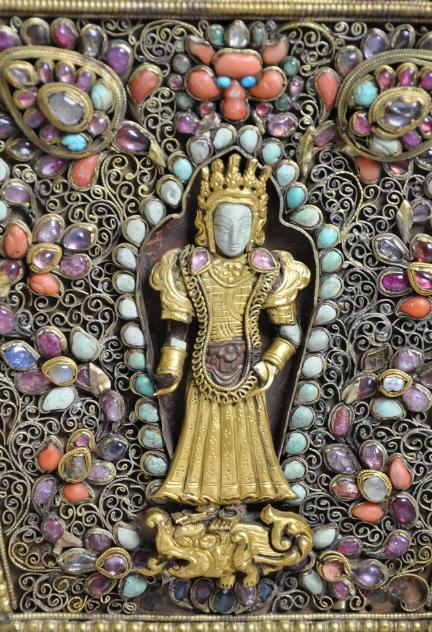 Pal, P., Desire and Devotion: Art from India, Nepal, and Tibet in the John and Berthe Ford Collection, Philip Wilson Publishers, 2001.